Michy Aja knows relocation all too well. Originally from St. Michaels, Maryland, Michy attended Virginia Tech (Go Hokies! ), where she earned a degree in Hospitality and Tourism Management. She then worked as the Special Events Manager at the Commonwealth Club in Richmond for four years. It was there that Michy met and married her Navy Pilot husband, Tim, and relocated with him to Jacksonville, Florida, where she worked in Interior Design before moving again to Opelika. The pair were thrilled to land in this lovely village! 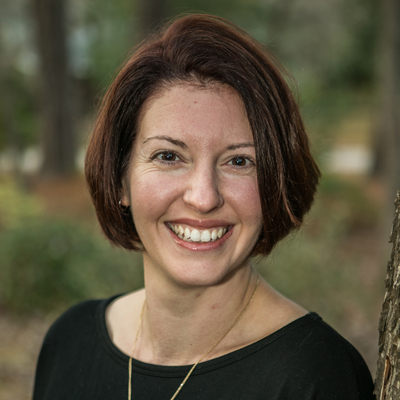 Michy loves being part of the Auburn and Opelika communities and loves using her experience with relocation to help clients, and especially military families, through that sometimes stressful process. This is what motivated Michy to become a Homes for Heroes® Affiliate. Click here to learn more about the program and who qualifies. Always looking for ways to improve her knowledge in order to make things easier for her clients, Michy has an Accredited Buyer’s Representative (ABR®) Certification, a series of courses focused on knowledge needed for agents working directly with buyer clients. The next accreditation she is working toward is Certified Residential Specialist (CRS) Designation. A bit of a foodie, Michy loves to cook for her husband and their daughter, Anna. She wishes she could garden, but has learned that shopping at the Opelika Farmers Market is much easier. Michy loves old houses, concerts in the park, travel, any reason to host a party, and has a serious obsession with Pinterest. Fill out this form and Michy will send you info on the Homes for Heroes program!